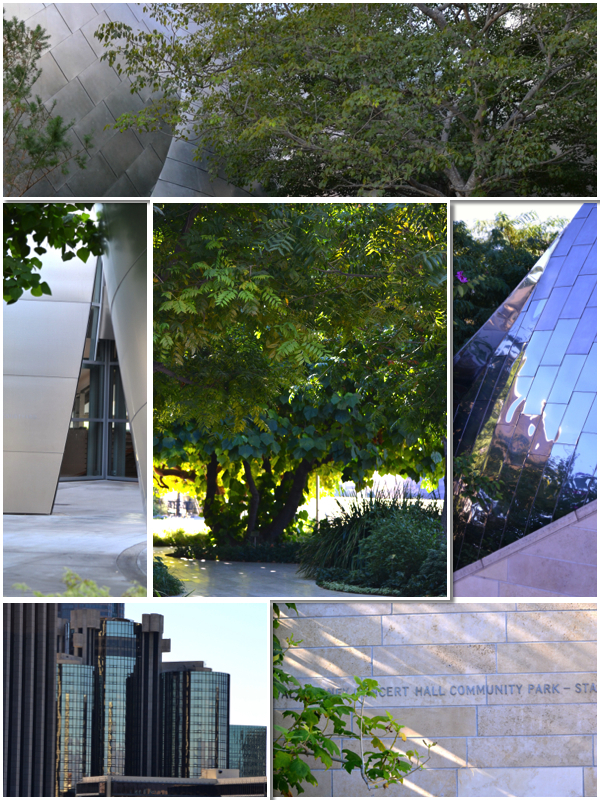 More Walt Disney Concert Hall…Discovering geometry and steel softened with a rose garden surprise! My previous post was about our New Year’s Eve plans to attend a concert at the Walt Disney Concert Hall. Each season thousands of people visit the hall to enjoy the many musical offerings, but it is also a popular tourist attraction for its architectural interest and garden. For the longest time I heard comments about the rose garden. How was it possible to have a rose garden and I had never noticed? Recently we decided to conduct our own walking tour so I could settle that question. Let me first tell you a little bit about the building. I won’t mislead! When I first saw the shell of the Frank Gehry -designed Disney Concert Hall I didn’t easily warm up to it. I might have been a little resentful. We’d held Los Angeles Philharmonic season tickets at the right-next-door Dorothy Chandler Pavilion for a few years. The Chandler Pavilion is one of the halls in the Los Angeles Music Center, with 3,197 seats spread out over four tiers. 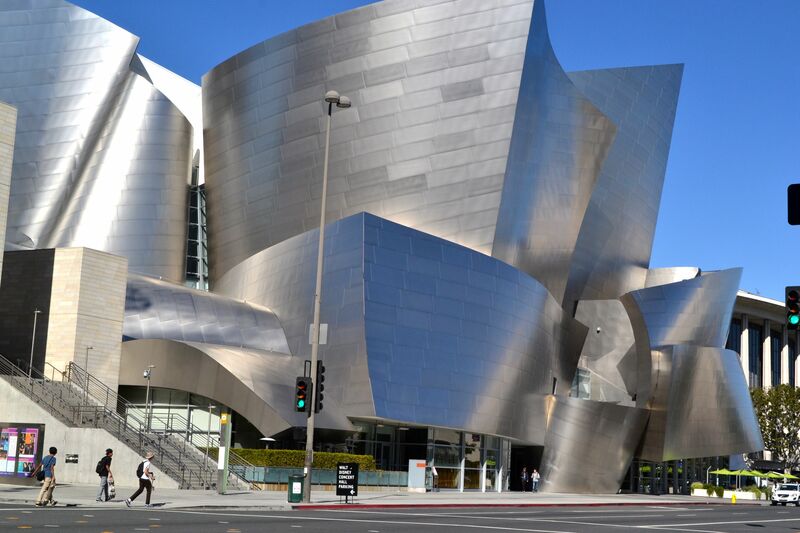 When the Disney Concert Hall was added to the Music Center complex, the Philharmonic moved to the state-of-the art, acoustically superior new facility, and seating capacity was downsized by about 1,000 seats. Season ticket sales also escalated, and we were priced out. This stainless steel origami-like design didn’t seem to fit in to the neighborhood. It was completely alien to my aesthetic appreciation. Alien, yes! Was it a space craft? There were some reflection problems that needed correction, too. Most of the exterior’s stainless steel was given a matte finish; however, some of the panels’ reflective qualities were designed to hold a high polish with mirror qualities. The contrast was quite beautiful, but posed very large problems for neighboring condominium owners experiencing extreme glare and reflected heat. Drivers also reported the hazard of a blinding reflective glare. The solution? The Gehry Partners executed a computer analysis of the building’s surface and in 2005 the offending panels were treated with a light sanding. It took some time, but after my first visit as a patron to the Concert Hall I began to appreciate the new kid on the block. Now I’m mesmerized by it. I don’t think you can really capture the essence of an architect’s design intention when speeding by in a car. But to walk around, touch it, take the time to marvel at the curvilinear greatness and suddenly my perspective shifted to seeing the building with new eyes. It was a bonding experience. But where is that garden? We walked around and poked our heads in every street level pocket we could find. Nothing. Where do THOSE stairs lead? Curiosity and investigation paid off! The rooftop of the Walt Disney Concert Hall is well worth the visit! In the heart of the city, traffic and bustle below, is a quiet, almost hidden oasis. It’s not an easy area to photograph because the pathways and small seating areas continue to follow the curves of the building’s design. But the view is well worth the effort to get there. But where is the rose garden? Not a literal rose garden after all! Were we surprised! 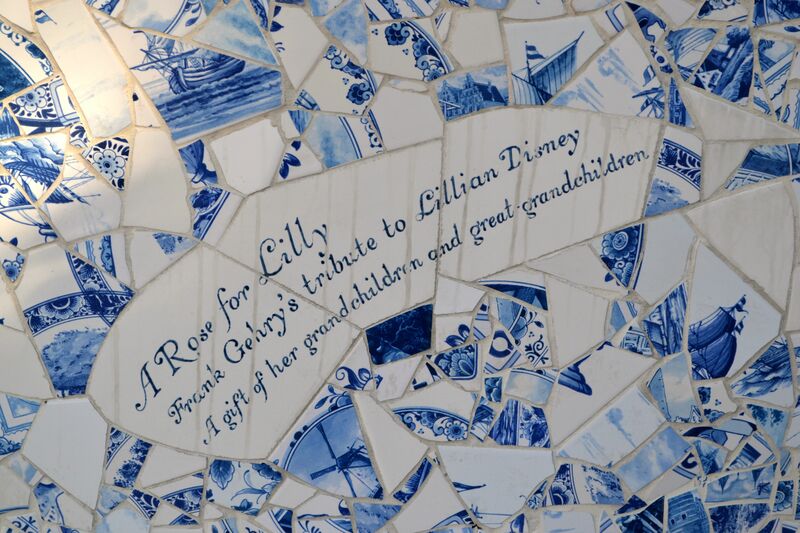 Prominently places as centerpiece to the sitting garden, we found a lovely gift to the Concert Hall’s original benefactor, Lilian Disney, designed for her by the Concert Hall’s architect and artist, Frank Gehry. How many people walk by this building in a day? Thousands! See what you discover if you continue to look up? And just down the street is another one of our favorite places to enjoy the evening. 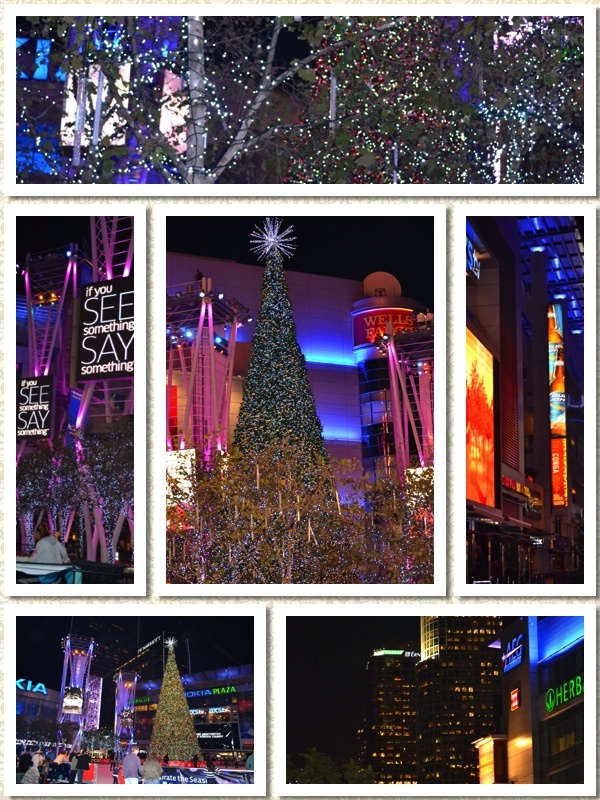 L.A. Live is a wonderful theater and sports complex, with beautiful hotels, fine dining, and for the holiday season, an outdoor ice rink, lots of lights and festive atmosphere. If you’re curious to learn what L.A. Live has to do with Batman, you’ll just have to come back. I think it’s time for me to close out and get on with starting my day. I have a busy day planned. But you know that wherever I go I’ll be keeping an eye out for something new I haven’t previously seen or experienced. That’s my favorite way to enjoy a weekend exhale. Despite the temptation to fall into the hectic and completely overextended season’s frenzy, I encourage you to slow down and “smell the roses.” Even a concrete work of art can offer a breath of fresh air. Don’t you agree? What are YOU doing New Year’s Eve? For once, we didn’t procrastinate! Too cold for cacti and tortoises? Let’s roll out the frost cloth! What an amazing building, Debra! Not my normal cup of tea but I can’t help admiring the boldness of the design and the lovely was the roof garden has been incorporated into it. I don’t think too many people were naturally drawn to the architecture of the concert hall, Perpetua, but like I said, it really did grow on me. I would love to have an “audience” with the architect and learn more of his process. The acoustics in the chamber are really amazing. I am sure for some, that makes up for not being too appreciative of the exterior design! 🙂 Thanks for taking my little tour with me! Thanks, Nancy. This building is really interesting…not like anything else around it, but I don’t think blending in was part of the architect’s plan! 🙂 I hope you have a wonderful weekend! Amazing architecture … of course I also thought, Fitting for LA. 🙂 I can see it as an attraction … and if I can just get my first trip to your city. 🙂 … By the way, just letting you know I will be hosting a Christmas Eve party … which I hope is accessible to you west coasters the night before. You and your friends here are welcome … here’s a hint … my theme is Gifts for All! Is this one of your on-line parties? How fun…we’ll have to see what we can do! 🙂 And then sometime, you will make it to Los Angeles and I’ll need to guide you a bit so you only see the parts I know won’t disappoint you! LOL! Have a great weekend. By the way, I had lunch with Rosie again today! 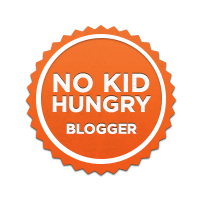 We mentioned you and how much we enjoy reading your blog! I thought my ears were burning today! 😉 … Yep … online party, a special holiday edition … and I promise joys for all! We did mention you Frank. I look forward to meeting you. Come soon. That’s quite a structure and I would really love to see & experience it. And how wonderful is that, putting a garden where one would least expect i? It’s the jewel atop the crown. Interesting ‘fix” to the sun problem, too. I’m surprised none or the architects saw that one coming. Don’t they call it “Sunny Southern California”? Glad they were able to “fix” it without detracting from the overall effect. Thanks, Debra, for sharing a bit more of your hometown with us. I asked the same question about the finish on the steel John…what did they think was going to happen? I think in part the plans were submitted many years ahead of the actual construction, which was also stalled for awhile with good old city red tape! Meanwhile, the condominiums went up in an area that hadn’t previously been non-commercial housing. The acoustical design on this place is really amazing. I would love to take a tour with an architect and ask a boatload of questions! 🙂 I enjoyed sharing about it, so thank you for your kind interest. It is not the design style that I like but I can appreciate it all the same. I find the design creative and superb. Who says it must fit in with other architectural designs? If it fit in, it wouldn’t be noticed and just another building. I bet it’s had much conversation over the design alone, and I’m sure many critics. Isn’t it good to think abstractly? Maybe I’m the strange one. Oh well, my son is an industrial designer … maybe I just perceive things differently! That’s what makes the world a great place … everyone is different, with different opinions! This is definitely a building I’d like to see next time I’m in LA. Not only is the design different, but it achieves the acoustical purposes of this building. Enjoy the concerts. Thank you for sharing this beautiful building. I SO wanted to become an architect: instead of playing with dollies drew plans and more plans and more surface plans since I was about 5-6! It was a difficult time for my parents in post WWII Europe and I was almost ‘made’ to study medicine instead!! When I see absolute briliance I enjoy that day and many more . . . I absolutely love this design in 21st century architecture and just wish I was there . . . not even to go inside, just to be there and perchance walk into the ‘secret’ places 🙂 ! hope I may share with some friends!! 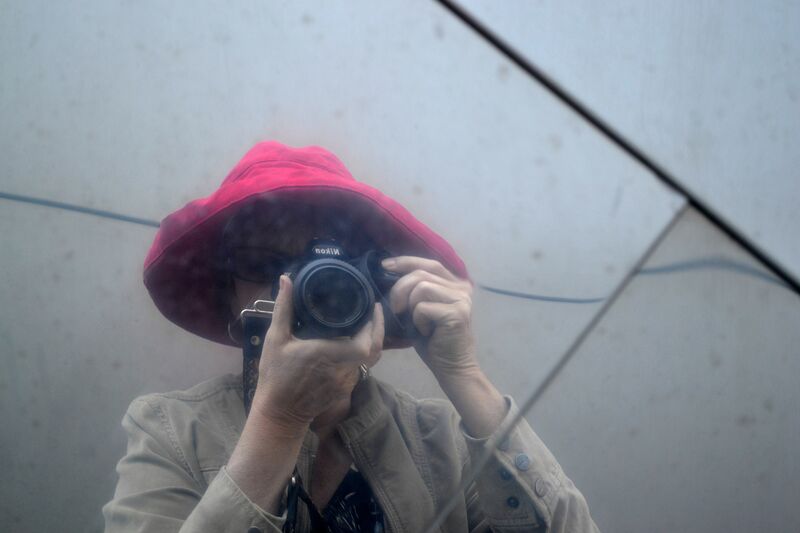 Debra your photos of Disney Hall are brilliant. You really-really-really are a pro with that camera of yours (so nice to see the self portrait). 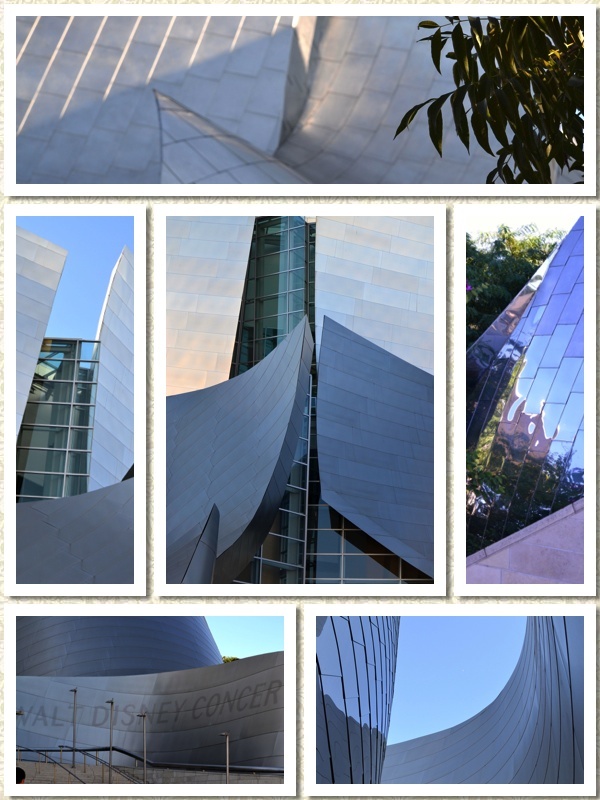 What a delicious treat to see these “up close and personal” photos, Debra, and what a strong statement Gehry makes. All those unforseen distractions and how they were remedied is interesting. Don’t you love it when everyone thinks outside the box – and then try to put everything back in it? I just loved this post. Enjoy your weekend. 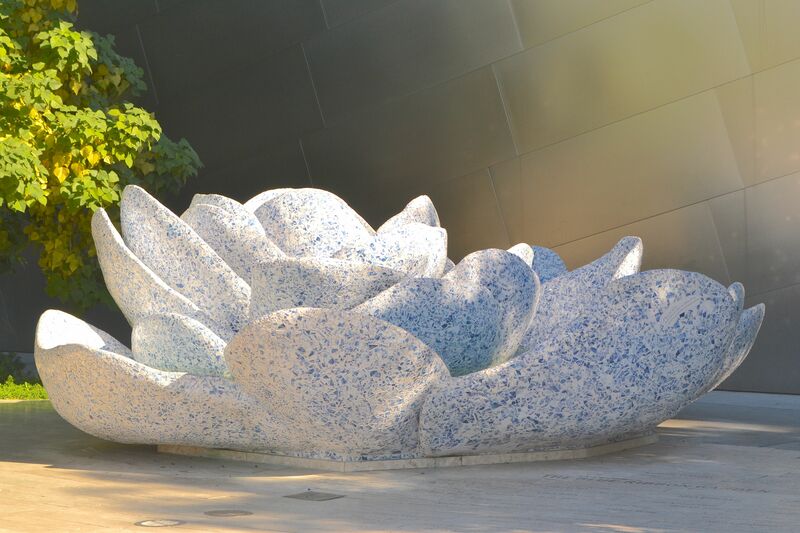 The rose sculpture is beautiful, the building is very different! I think because it is so different from all the others around it, it can be difficult for people to appreciate it, they no doubt do feel that it is indeed ‘alien’. The amount of work that has gone into it is pretty impressive, sad about the loss of seats though. I love the rose sculpture. Because of MTM, I detest Gehry. He was very proud of me, though. When I saw the picture here, before I even read anything, I asked him if Gehry designed this building. 🙂 So, there has to be some value in an architect’s aesthetic being so easy to recognize. You know how I feel about Walt Disney Concert Hall. Again, your images of it are way better than what I got. And I picked up something more about it with the information you’ve provided. I did see the rose fountain. I was there but the sun shadow was not cooperating with me, and that I couldn’t get a good picture of it to share it in my blog. You can say I have standards. Hehe. Your cliffhanger of Batman… bwahahahahaha … hook, line and sinker … I will forward to it. 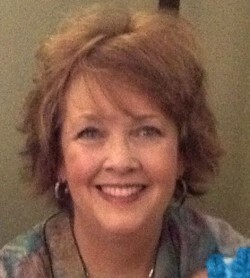 I like all your photos, Debra, and your enthusiastic way of writing. It was a pleasure to go with you on this tour. I’m so glad you took pictures of that amazing rooftop oasis – I HATE heights and could never visit it! It always amazes me when architects and builders don’t take obvious things into consideration, like those reflective surfaces on the building. What did they think would happen, for heaven’s sake?! Someone also designed a tractor trailer with brightly reflective sides and back, and as we were driving down the highway we were actually blinded when the sun hit one of those surfaces. Talk about dangerous! Strikingly bold and brash, and it is good to know that it does work in the most important area – acoustics. However, one has distincly mixed feelings about the increase in prices and the reduction in capacity.